There are hundreds of customer service metrics your support team can track. But you will only understand how well you’re supporting your customers if you are tracking and acting on the right data. Metrics are indispensable to every great customer support team – from planning hiring to ensuring your team has the resources they need to succeed. But when your customer support team are drowning under a sea of queries, it can be difficult to see the forest for the trees. A lot of startups use the “crystal ball” approach to customer support metrics, thinking that the answer to all their problems can be found buried in endless charts and graphs. But this approach can often leave you with more questions than answers. It’s important to keep the data in perspective, and not to let them obscure your real job – supporting your customers and creating the best customer experience possible. Here are the 5 key customer support metrics we’ve found most useful as we scaled our support team to support over 15,000 customers in 85 countries. One of the simplest but most important metrics is a count of every single interaction your team has had with your customers over a given period. Tracking this over time can give you a 360 degree view of support trends. Are we seeing support requests and support tickets spike at certain times of the day? Are we experiencing more bugs in our product? It’s a good place to start when building a customer support hiring plan, and gives you a good idea of how much work is on your team’s collective plate. Be warned – taking total conversations as your only metric can be misleading. Not all conversations are created equal – some queries don’t need to be responded to, while others were never meant for your team in the first place. 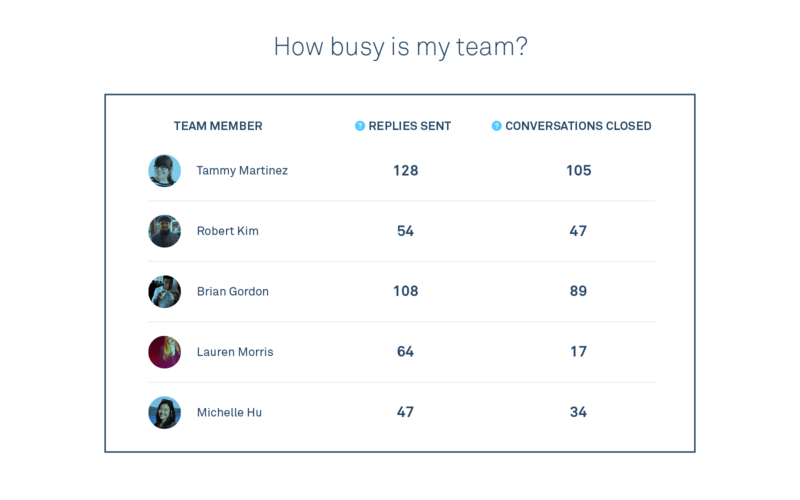 At Intercom, we track the number of conversations that each teammate handles (more traditional customer support operations would call them cases). It’s a great way of showing when and where the team is being overworked and needs backup. In addition, we have benchmarks for the number of conversations per day we expect an individual to handle based on their role and support experience. These benchmarks give everyone a clear idea of what is expected of them. That said, there are many reasons an individual might fall short of a given benchmark. For example, the individual may have encountered a low first contact resolution rate for the day because they got wrapped up in solving a customer’s issue which was particularly complex. Recently, we have decided to use this metric as a KPI for individual reps and engineers on the team. But we still feel strongly that it’s not a quota, but a conversation starter. This metric is the cornerstone of our recruitment planning. Generating it is fairly simple – just divide the total conversations your team handles by the number of people on the team by seven days (or five if you don’t offer weekend support). Deciding on what’s a “good” value isn’t as straightforward. It will be different for every business, every product and every team. 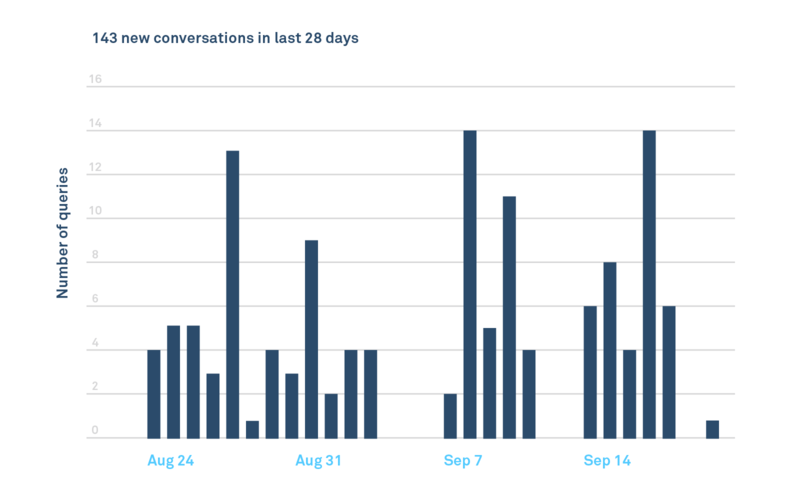 At Intercom, we used to shoot for roughly 35 conversations per teammate per day. We arrived at this number after looking at a lot of historic data, and honestly discussing our workload within the team. But more recently, we’ve lowered that to around 30 as our team has grown and become more complex and responsible for a broader spectrum of duties. The key point is that this figure isn’t immutable; it’s something we regularly revisit and update as our team and workload changes. From a customer’s point of view, a lower response time is always better. But depending on how you’ve defined your support, response time is often the first place you make trade offs for some or all of your customers. For example, you may decide free customers won’t get a response until all queries from your paid customers are dealt with. If you go down that road don’t be surprised if you see free to paid conversion rates drop off. A significant outage that generates lots of customer contact, as per the graph above, can also skew your support metrics. It’s worth remembering that time to first response can be gamed easily by your team – it can be as simple as answering lots of calls and hanging up immediately or copying and pasting canned responses into messages. Making first response time the primary target for individual performance isn’t wise. Both the average (mean) and the median – which limits the effect of outliers in the data – are a good start. A very useful additional data point is to look at the 90th percentile value. This is the longest wait time for 90% of your customers that get in touch. Grouping your response time stats by day of the week and hour of the day is especially important. Spotting times of the day or week that you perform badly is a clear indicator that you might need to organize your team members differently e.g. staggered shifts, or hiring people for the hours you are not covering adequately. Total number of conversations and time to first response give you a good quantitative idea of how much work you’re handling and how quickly you’re handling it. Unfortunately, they don’t give you any idea about the quality of the work you’re doing. No matter how fast your resolution time, if a customer wouldn’t recommend you to a friend after your interaction on live chat, you’re doing something wrong. There are many ways to measure customer satisfaction. But making it ubiquitous and extremely lightweight is key to getting a large number of users to respond. A popular approach is the one pioneered by Basecamp. They added a simple question to the signature of all their support emails asking how they did and giving the user just three simple links to click (Good, OK, Bad) in order to register their response. There are also many products that allow you append a simple Net Promoter Score (NPS) survey to the bottom of emails. This makes it easy to know your customer satisfaction score and requires very little effort on your customer’s part. Having the right data can help you answer difficult questions. More often than not though, it just leads to more questions. Choosing only a few baseline customer service metrics to track helps you avoid analysis paralysis, while giving you and your customer service team actionable insight on both day-to-day tactics and strategic planning. This will ultimately lead to happy customers, a strong sense of customer loyalty, and less stress on your support team. Want to learn more about providing amazing support? Download your copy of our latest book, Intercom on Customer Support.